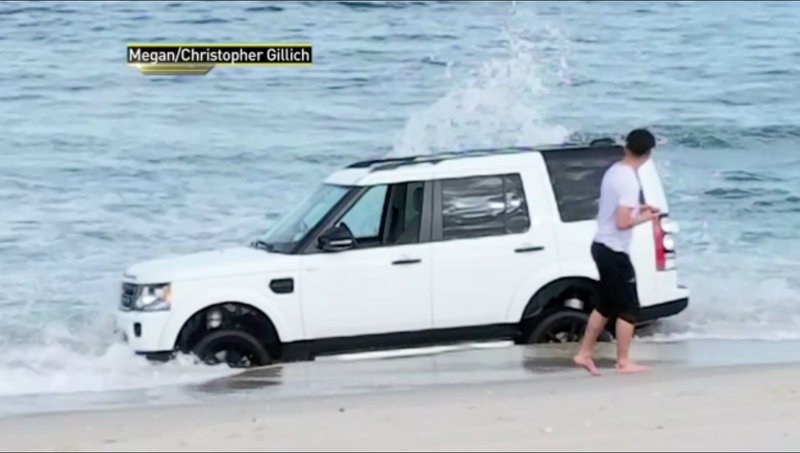 An overzealous off-roader at the Jersey Shore apparently posed his Land Rover close to the tide to get what might have been an excellent picture of his truck. Things started to go south as soon as he rolled onto the wet sand. NBC reports that this LR4 was eventually recovered (and still running!) at low tide from Island Beach State Park “about 15 miles southeast of Toms River” in New Jersey. And yeah, it seems like the owner really was just trying to take a sweet picture of his shiny white overland rig in front of the crashing waves. As I’m sure you’ve seen the video that Megan and I took this afternoon, you’ll now see the video displaying the sounds and electrical damage via flashing headlights, as this kid decided to drive off the beach. The waves beat the hell out of this car, but the owner arrogantly told me that it’s okay because it’s waterproof. He also felt that it was necessary to keep it running cuz if he shut it off it would not start again. He refused to take the advice to get rid of it because the vehicle’s a limited edition. Better watch out if you’re looking to buy a white late-model LR4 in the Jersey Shore area. This one is assuredly doomed to be plagued with electrical, mechanical and structural issues (image the rust from a salt water soak!) for the rest of its life. Local news says that the truck had an oversand permit and its hapless operator won’t face fines or charges for his idiocy, besides what was definitely an exorbitant towing fee. I mean, if I had a fancy LR4 with a beach sticker I’d be taking pictures of it in the sand, too. But if you find yourself in this situation, maybe stay out of the wet stuff. Pro tip: if your feet sink in, a three-ton SUV probably will too. The worst part of this whole story is that I haven’t been able to find out if the guy ended up getting a good picture or not. At least, this truck isn’t coming up on any of the logical Instagram hashtags.